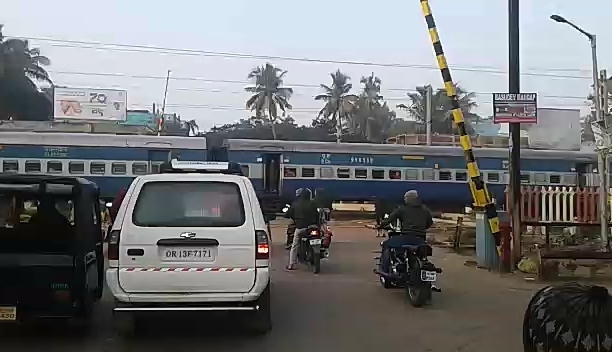 ONI Bureau: The East Coast Railway (ECoR) on Saturday suspended Loco Pilot Govind Sahu and Assistant Loco Pilot Umesh Kumar in connection with the incident of a train passing near Matiapada railway level crossing in Puri district this morning while the gate was still open. The train was Puri-Haita Tapaswini Express. As per the report, the gateman allegedly did not close the gate despite instructions from the station master. However, the preliminary findings of the committee found negligence of duty on the part of two staff as they stopped the train for a minute near the gate, but proceeded towards Puri while the gate was still open, said the committee. Fortunately there has been no casualties were reported in the incident as the public waited till the train passed by.